Kay Martin is a professional artist based in Austin, Texas. To view some of the artists selected work thas has been sold or commisioned, click here. Show someone special you really care by surprising them with a wonderful gift of original artwork. Giclee prints are also available on some paintings. If you see a painting that you would like a print of, please email kaysart@sbcglobal.net. Commissions are available. Currently showing at Gallery Off the Square in conjunction with the Artists Co operative in Georgetown Texas. Exhibits changed out months before the first Friday night Art Walk. Kay is showing monthly through January 2013. Copyright © 2001 Merit Marketing. All rights reserved. Georgia O'Keefe, famous painter, loved to work at Ghost Ranch. 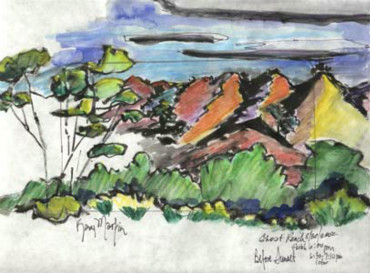 My New Mexico scetches are from Ghost Ranch and the surounding area. The scenery was inspiring and breath taking. Click on the images below to view the artists available artwork. These pieces are available for purchase. Contact the artist of you find anything of interest. Copyright 2001 Merit Marketing. All rights reserved.